I really like your shot of the Raven calling for a mate, or whatever it was doing. We used to live in NE NSW, and can't be sure that we didn't see Forest Ravens then, though we weren't looking specifically for them, so can't be sure we did, either. HAving just visited NSW again recently, the call of the Australian Raven seems very high, thin, and "whimpy" after the deep baritone of our own 'tasmanicus'. 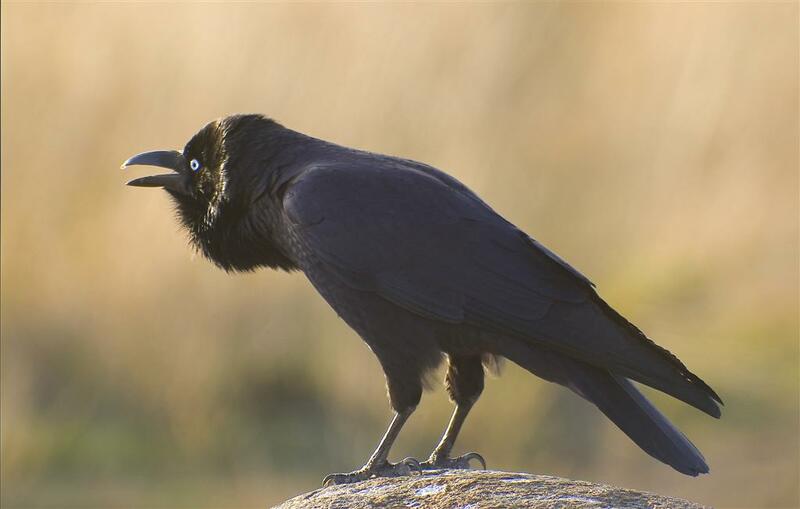 Unfortunately, when we lived on the Northern Tablelands, we were more concerned with distinguishing Torresian Crows and Little Ravens, so weren't listening carefully enough for the rich Baritones we have now come to be familiar with. I have read where the most common Corvid between Armidale and Coffs Harbour (a little out of our earlier range) tends to be the Forest Raven. Much easier here, where there is only the one to choose from. Thanks for your comments John. I took quite a few shots, but this one captured, for me, something of the essence of the bird. No wonder myths and believes thrived in earlier times about crows and ravens in general. They certainly are a cunning, intelligent bird, with a lot of personality. Despite all the crows and ravens I've seen feeding on road-kill, I don't think I've ever seen one of THEM as road-kill!! You don't know how easy things are in Tasmania until you move to NSW and have five corvids to tell apart! Something I have not mastered. 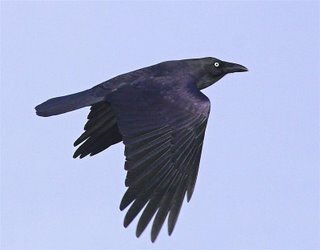 Antway, when I read up on the Northern NSW race of Forest Raven ( the so called 'Relict Raven')one of the distinguishing features mentioned in books is that the tail gets pointed downwards as they call. Your photo suggests the Tasmanian ones do the same thing. Do you think that's right? Food for thought. They do indeed drop their tails as they call. I have been watching one calling in a neighbour's tree for the last cople of mornings, and they seem to both raise their wings AND drop the tail with each throaty "Caw". It will be interesting to hear whether the mainland "Relict" Raven does the same!